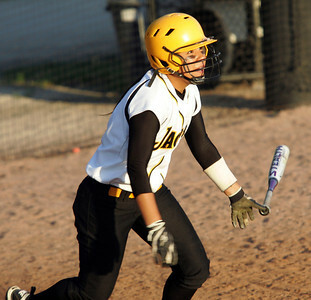 H. Rick Bamman - hbamman@shawmedia.com Jacobs' Nicky Chapa watches the ball sail into the outfield for a tripple. 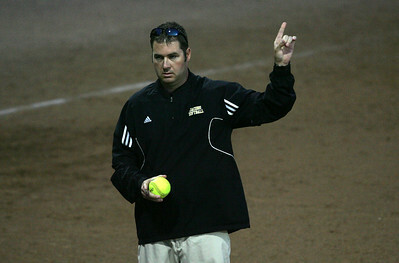 H. Rick Bamman - hbamman@shawmedia.com Jacobs' Nicky Chapa and coach Jeremy Bauer applaud her tripple in the second inning agains Elk Grove during the IHSA Class 4A Girls Softball Supersectional Monday, June 4, 2012. Jacobs lost 4-1. 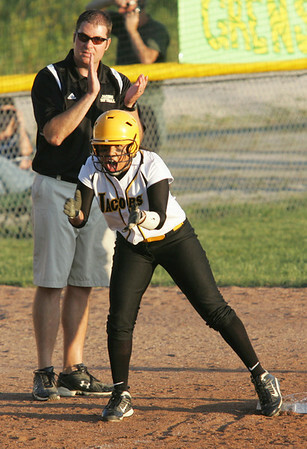 H. Rick Bamman - hbamman@shawmedia.com Jacobs' Tori Berg is on deck late in the seventh inning. 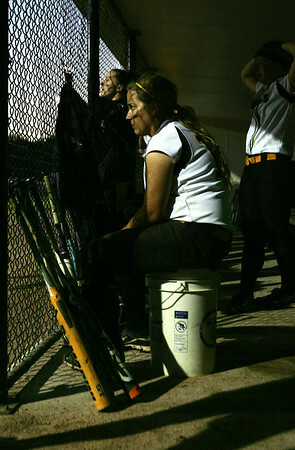 H. Rick Bamman - hbamman@shawmedia.com Jacobs' Alyssa Lach sits in the dugout late in the seventh inning during the IHSA Class 4A Girls Softball Supersectional Monday, June 4, 2012. Jacobs lost 4-1. 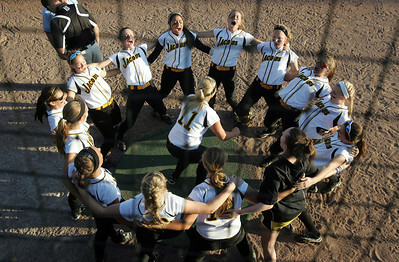 H. Rick Bamman - hbamman@shawmedia.com Jacobs' Maggie Hansen (11) leads teammates in a cheer before the start of the IHSA Class 4A Girls Softball Supersectional Monday, June 4, 2012 at Judson University in Elgin. Jacobs lost 4-1. H. Rick Bamman - hbamman@shawmedia.com Jacobs' Kelsey Cummings watchs a ball go foul in the IHSA Class 4A Girls Softball Supersectional. 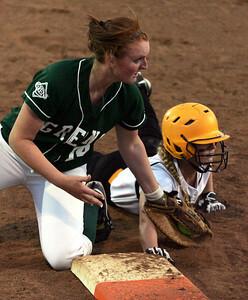 H. Rick Bamman - hbamman@shawmedia.com Jacobs Kaitlynn Woloszyk is safe at first on a pick off attempt by Elk Grove's Becca Walz in the top of the sixth inning during the IHSA Class 4A Girls Softball Supersectional Monday, June 4, 2012. Jacobs lost 4-1. H. Rick Bamman - hbamman@shawmedia.com Jacobs' Kelsey Cunnings (left) and Katie Kirker have a disscussion during a time out during the IHSA Class 4A Girls Softball Supersectional Monday, June 4, 2012 at Judson University in Elgin. 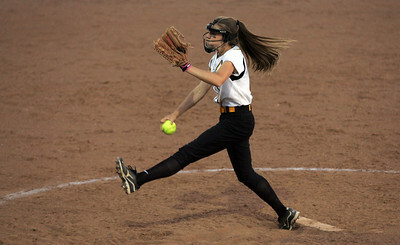 H. Rick Bamman - hbamman@shawmedia.com Jacobs' Katie Kirker pitches against Elk Grove in the first inning during the IHSA Class 4A Girls Softball Supersectional Monday, June 4, 2012. Jacobs lost 4-1. 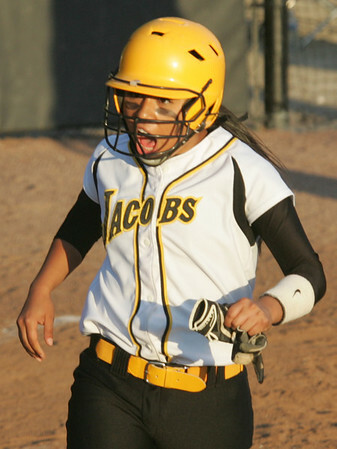 H. Rick Bamman - hbamman@shawmedia.com Jacobs' Nicky Chapa reacts as she crosses the plate to score a run after an illegal pitch. 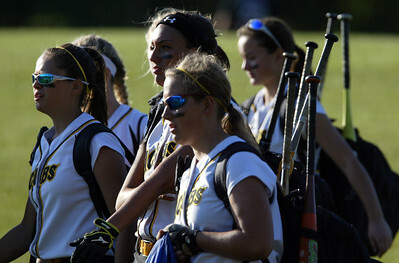 H. Rick Bamman - hbamman@shawmedia.com Jacobs' players arrive at Judson University in Elgin to take on Elk Grove in the IHSA Class 4A Girls Softball Supersectional Monday, June 4, 2012 . H. Rick Bamman - hbamman@shawmedia.com Jacobs' coach Jeremy Bauer signals to the bench. 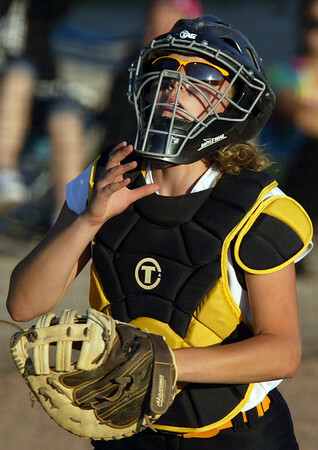 Jacobs' Katie Kirker pitches against Elk Grove in the first inning during the IHSA Class 4A Girls Softball Supersectional Monday, June 4, 2012. Jacobs lost 4-1.